Remember over a year ago when Apple unveiled its AirPower wireless charging pad and AirPods wireless charging case? Well Apple hopes that you don’t remember that at all. In fact, the company completely removed all mentions of the AirPower from its website, so it might never see the light of day. If you want cord-free earbuds you can charge wirelessly, check out the brand new Rowkin Ascent Charge+ True Wireless Earbuds that were just released today. We tried them out and they offer great sound quality as well as a much more secure fit than AirPods since they have rubber tips. They’re also the same price as AirPods despite the fact that they come with a wireless charging case! Also, if you’re not interested in wireless charging, there’s another version called Rowkin Ascent Micro True Wireless Earbuds that are the same thing but with a normal charging case instead of a case that’s compatible with Qi wireless chargers. 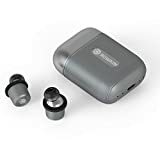 SMALLEST SPORT BLUETOOTH 5.0 CERTIFIED TRUE WIRELESS STEREO: Pairing 2 cordless earbuds wirelessly is quick and easy like the Apple AirPods since they are automatically on and in pairing mode as soon as you pick up the earbuds out of the case. Ascent Charge+ is equipped with the latest Bluetooth 5.0 certification, enabling strong wireless connectivity to your smartphone and other Bluetooth devices by giving them unparalleled sound quality and connectivity. GO WIRE-FREE WITH QI WIRELESS CHARGING AND TYPE-C: Get your hands on the newest technology in the market. The Rowkin Ascent Charge is currently the leading product on the market with both Qi charging and Type-C charging capabilities. Leave wires behind forever, and charge your Ascent Charge+ case or other device with the included Qi charger. When you receive an incoming call, the Ascent Charge+ true wireless earbuds support crystal clear calls in stereo mode. 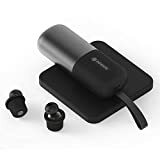 ALL-DAY BATTERY WITH DUAL-FUNCTION PORTABLE CHARGER: With the compact conductive portable charging system, your Rowkin Bluetooth earbuds will never run out of battery. The dual-function portable charger allows you to charge both wireless earbuds up to 15 times for 50+ additional hours of music/playtime. It also serves as a power bank for your other mobile devices. Simply connect a charging cable to the Type-C port and charge any device at rapid speed. IN-APP EARBUD LOCATOR AND SOUND CUSTOMIZATION: Enjoy the freedom of true wireless earbuds without worrying about losing or misplacing them. Not only does Ascent Charge+ have a secure retention wheel design to keep your earbud in place, but we also have a free accompanying Rowkin App is available on iOS and Android and has a convenient “Find My Earbuds” feature which can track where your Bluetooth earbuds were last used. You can even personalize and take control of your listening experience. DESIGNED FOR YOUR LIFESTYLE: One-touch setup makes pairing the Ascent Charge+ to your iOS or Android device fast and easy, no buttons needed. With the capacitive one-touch feature, you can easily access Siri or Google Assistant, too. The WaterSafe nano coating technology ensures that it’s sweat-proof, water resistant, and IPX5 waterproof. Making this true wireless Bluetooth headphone set perfect for working at the office or getting out there and hitting the gym, running, biking, and hiking.